This past Saturday, clients were flowing in, but with so many new nail tech students, most were being assigned to their services. So I had the pleasure to do a Gelish mani on one of my fellow students. She let me have free reign over her colors and design, so I decided to do a tribal look using my tribal tutorial, which you can try out yourself here! Apologies for the somewhat blurry picture. I love the way it turned out, and she told me she's been receiving lots of compliments on it. 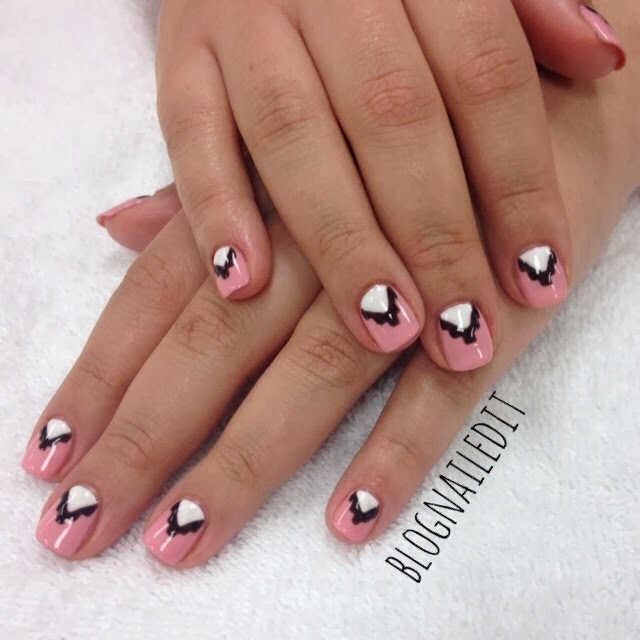 Have you tried nail art with gel polishes before? Do you have a favorite gel to work with? Is gel harder to work with than polish, or are they about the same? I would say they're pretty close. To work with layers of polish (for example, my pink, black and white shown), you have to cure in between each layer, so there's a little extra waiting, but otherwise it's pretty close. The layers can also be a little thin in my somewhat limited experience thus far. It's gorgeous and I can't wait to try Gelish out! Cute! I like it :).